I strongly believe one of the cornerstones for the successful digitization of oceans is a reference architecture. I believe this also holds true for the digitization of oil and gas, but I see this digitization as a subset of the oceans. Or more specifically, I see the digitization of maritime oil and gas as a subset of the digitization of oceans. I regress... One of the most important aspects of the reference architecture is its openness (as opposed to proprietary). If we are wanting to spur innovation in Atlantic Canada we need every small, medium, and large organization to realize benefit from shared digital resources. We need a way for all these organizations to openly communicate and build this digital ecosystem. The digitization of oceans reference architecture will define (or utilize existing approaches) the "language" that all oceans technologies communicate with one another and remember their collective history. An example; the reference architecture would specify the digital messaging structure for an ocean temperature event. Therefore, when a small startup (that specializes in ocean temperature sensors) needs to publish their data they need only comply with messaging structures for ocean temperature. This would allow everyone in the ecosystem to get at their temperature event data as soon as it is available. Also important, is the startups market for ocean temperature sensors customers includes everyone who is aligned with the oceans reference architecture and it's messaging structures. Another example; the reference architecture would specify the underwater wireless communications approaches and suggested protocols and practices. All allowing the temperature event data to be broadcast and communicated to the historical repository for archiving. Another example; the reference architecture would specify all the messaging structures and the data storage approaches so the data could be archived and be available through time. The historical archive would allow for retrieval, searching, research, planning, and analysis. Disclaimer - All views expressed on this site are my own and do not represent the opinions of any entity whatsoever with which I have been, am now, or will be affiliated. They are views created by my many years as an IT professional and, more importantly, an enterprise architect responsible for building large and distributed systems. 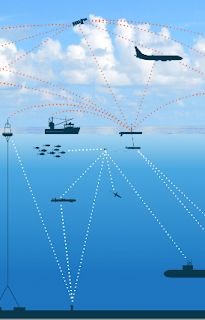 This post on Reference architecture for the digitization of oceans I have seen this photo. And i am very happy to see this. This kind of posts are really effective for visitor. Thanks for this new technology news. Keep up the good work. Really which content you are posting that is very accurate and informative content for us. Thank you very much.